The model-view-presenter pattern is a very powerful way to manage user interaction. It seems popular to use it on the server-side when creating HTML, but why not use it client-side instead? There is a simple REST service on the server that returns data which is called by the Model. No HTML generation occurs on the server. Download the source code. You must have Script# installed as well. Thanks for the screencast, i'm going to take a closer look into Script#. Have you had a look at ProMesh.Net? 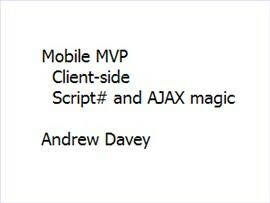 Seeing as client-side MVP is viable, the next step would be create a framework to reduce some of the boiler-plate coding required. For example, the View class that basically maps to and from DOM elements could probably be code generated. 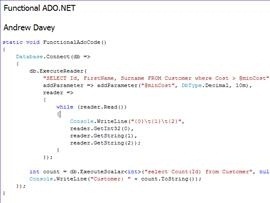 Thanks for the link to ProMesh.NET, I like the use of attributes making the whole process much more declarative. I'll certainly be considering similar approachs when expanding my client-side MVP framework. So I reckon phase two is to use my tier-splitting macro to enable certain model methods to be decorated with [RunAtServer] attributes. The last post is from September.... just wanted to know how did you do with this design? You mentioned you was doing a project, how did it go? Is there an updated version of the framework?